Just the other day, a new San Diego client suggested adding new retaining walls to hold a slight slope near the sidewalk. Why? I questioned. She thought the definition would be a welcome element to her front yard. After all, the next door neighbor has one of masonry, stucco and brick cap (sort of dated, but functional). I stated it could be more artful if we used some curving lines to the new wall. We were removing all the lawn to create a new garden with a more organic look. My gut reaction was why spend the extra money to build walls if they serve no purpose. Unless adding the wall would increase the use or function of the space, why build it? My role is to keep a client’s budget in check. And at the end, in this scenario, adding some great boulders to the slope would actually have a more pleasing effect than a wall. A few options for retaining walls are the typical CMU, concrete masonry unit block wall with stucco and some type of a cap, brick, stone, precast concrete (see www.stepstoneinc.com) or brick. These elements are great when you want simplicity and continuity as then to match the stucco finish and paint color of the house will tie the walls to the architecture. Segmental walls, such as Keystone Legacy or Country Manor ( www.keystonewalls.com ) have a stronger aesthetic and can be a do-it-yourself project. Certain walls are only meant to be built to a certain height. Any retaining wall over 36 inches tall does require a permit. To build higher, a geo-grid is added for stabilization. I’ve seen 6 foot tall segmental walls come tumbling down when not constructed correctly. There are many manufacturers of this type of wall such as Allanblock ( www.allanblock.com ) or Belgard ( www.belard.biz ). Finally, another less costly (and not as permanent) are PTL (Pressure Treated Lumber) retaining walls. In some designs, attempting a more contemporary theme, these wood walls are a great statement. This type of wall can be built rather quickly once all the 4 x 4 posts are set into the slope. Using gravel and a Mirafi (www.tencate.com) drain board, the outer PTL boards are bolted into the 4 x 4s for a finished wall. Adding a wood cap will give this type of wall a simple, yet effective finished look. The cost is less than some other walls, but again the longevity is not the same. These are just a few types of walls, using natural boulders and rock is another concept. And in the scenario I mentioned above, the actual slope can be planted with the appropriate plant materials to hold the slope without any walls. 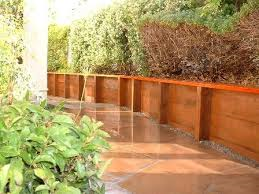 As we live in San Diego, where we have slopes aplenty, retaining walls are a common element. Letz Design has the experience and creativity to carefully place these features on your site and within your budget. Contact me today to learn more when you have a problem slope or want more level space in your landscape.